Dental implants are designed to provide a foundation for replacement teeth that look, feel, and function like natural teeth. A person who has lost teeth regains the ability to eat virtually anything and can smile with confidence, knowing that teeth appear natural and that facial contours will be preserved. Dental implants are tiny titanium posts that act as tooth root substitutes. They are surgically placed into the jawbone. The bone bonds with the titanium, creating a strong foundation for artificial teeth. In addition, dental implants can help preserve facial structure, preventing the bone deterioration that occurs when teeth are missing. 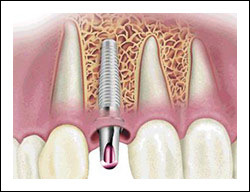 Dr. Gupta is considered one of the premier implant surgical specialists. Many of our implant patients are referred to our practice because of Dr. Gupta’s expertise in complicated cases which require bone augmentation and regeneration. Dr. Gupta has received a specialty certificate in Dental Implantology which means she has received an extra three years of surgical training in order to become the most qualified doctor who places dental implants. Dr. Gupta is one of the premier dental surgeons in Westwood and Bergen County.